Sync the frame range in your scene with the one stored in Shotgun. This document describes functionality only available if you have taken control over a Toolkit configuration. Please refer to the Shotgun Integrations User Guide for details. This is a simple yet useful app that syncs your current file with the latest frame range in Shotgun for the associated shot. If a change to the cut has come in from editorial, quickly and safely update the scene you are working on using this app. Towards the end, it will display a UI with information about what got changed. 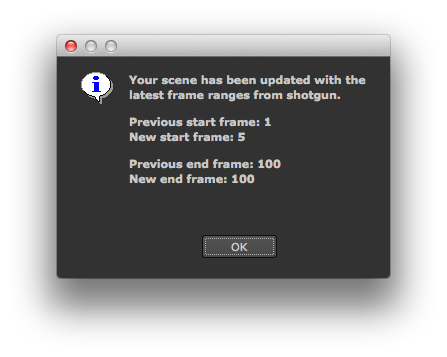 This app helps managing the frame range in the currently open scene. You can access it from the Shotgun menu by clicking the Sync Frame Range with Shotgun menu option. When you click it, the Shotgun Toolkit will look at the shotgun entity associated with the current work area (typically a Shot) and look for in and out fields which contain the in and out frame information. Typically, this is something used in conjunction with Shots and in that case the app uses the standard shot in and out fields defined in Shotgun's default config. However, it is perfectly possible to configure the app to pull the frame ranges from other fields too. If you have access to the Shotgun Pipeline Toolkit, you also have access to the source code for all apps, engines and frameworks in Github where we store and manage them. Feel free to evolve these items; use them as a base for further independent development, make changes (and submit pull requests back to us!) or simply tinker with them to see how they have been built and how the toolkit works. You can access this code repository at https://github.com/shotgunsoftware/tk-multi-setframerange. Description: The Shotgun field to use to retrieve the in frame. The app will look for this field on the entity associated with the current context (e.g. the current shot, current asset etc). Description: The Shotgun field to use to retrieve the out frame. The app will look for this field on the entity associated with the current context (e.g. the current shot, current asset etc). 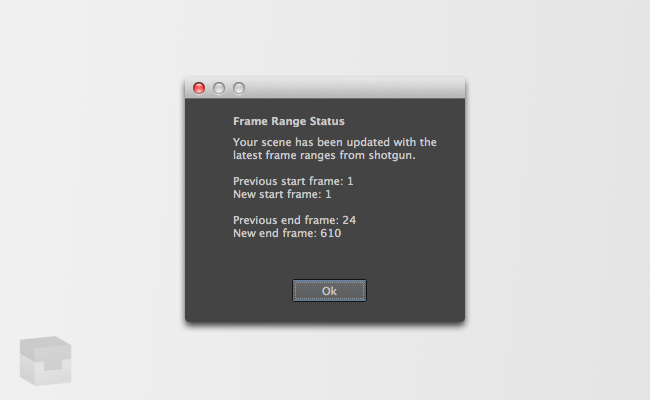 Improved formatting for display of frame ranges in nuke. Improved handling of multiple frame range updates. Details: The app now attempts to update the frame range every time you run it. This is a slight change to the behaviour - previously it would first check and see if the frame range needed updating and if so attempt to update it. This was causing some issues when a shot for example had different anim and render frame ranges. This release solves this by running the update every time to ensure that all fields are updated. Details: - Softimage logic now sets the global in and out range as well as the render range. - Houdini logic now sets the global frame ranges via hscript tset command. Maya frame range adjustments now also updates the render globals and the animation frame range. Uses new Tank QT access. Updated manifest to be v0.12.5 compliant. Hi, it's possible to add this to the app? At the moment I need to clone the app to add this. Sorry about the extremely delayed response and many thanks for your valuable contribution! I have just pulled this into github now and we are just going to quickly QA it and then we'll release this change as part of the offical toolkit code base! shouldn't it be shots and 3dsmax? There's not a great place in the default Shotgun schema that tracks FPS at the level of a project or shot. If you're interested in putting in a feature request for this, could you contact support@shotgunsupport.com with an explanation of how you're tracking FPS in Shotgun, and we can get the request logged. Any plan to add the frame rate sync?This is really missing.